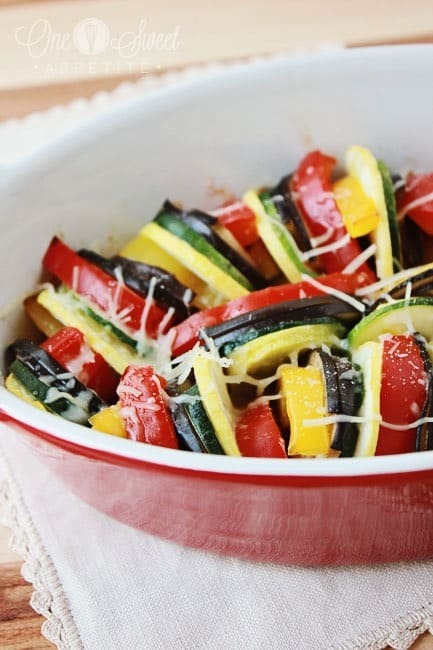 Bring the classic Disney movie to life with this veggie packed Ratatouille! 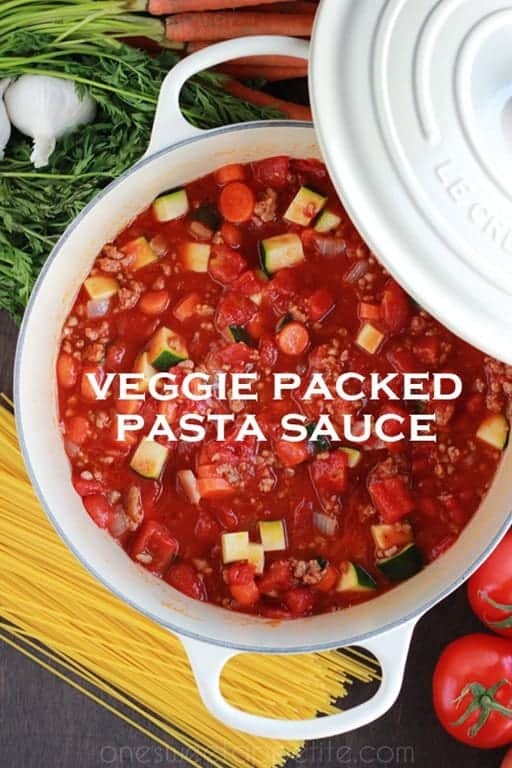 Quick, delicious, and fun for the entire family. Our biggest vacation plans this year happen to be to Disneyland and I’m not too enthused. I grew up in southern California and love to go back for visits but Disneyland mid summer is not my favorite place. It’s hot, crowded, and well… yuck! HOWEVER, I have a four year old that is over the moon excited. He gets to visit Mickey Mouse and see Cars land?!? What more could a little boy ask for? His enthusiasm has gotten me in the Disney spirit and we’ve decided to start a new series here on the site! Once a week for the month of June (and apparently one the last day of May) I will be posting a recipe that is inspired by a Disney movie! We are already huge veggie eaters so selling us wasn’t too difficult. This was DELICIOUS! Not kidding… I will probably make this several times a month. I was expecting some crazy off the wall hard recipe, but was pleasantly surprised with the ease and flavor that this dish has. Even my little guy gobbled up his portion. Another bonus to this recipe is that you can have your kids watch the movie, and then get them into the kitchen to help you cook this up! You will be amazed just how quickly the dish disappears! One last comment before I go… I do recommend you invest in a mandolin slicer. It made slicing the veggies quick and painless. Just watch your fingers! Stir together your onion, garlic paste, and tomato sauce. Spread into the bottom of a 9 inch pan. Line all of your chopped veggies in your dish. I started on the outer edge and worked my way in. Drizzle with olive oil and sprinkle with salt and pepper. 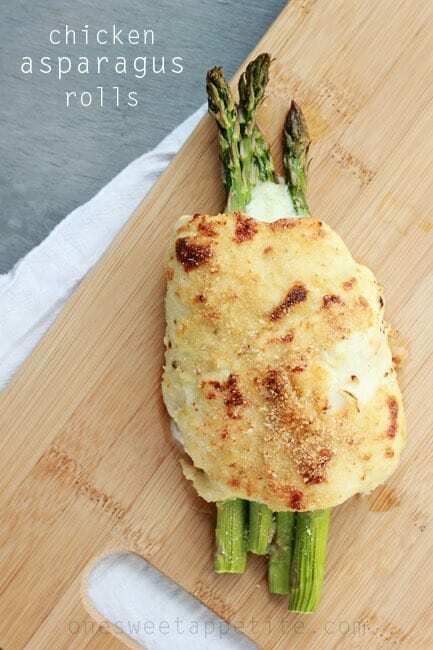 Cover your veggies with a piece of parchment paper slid just inside your baking dish. 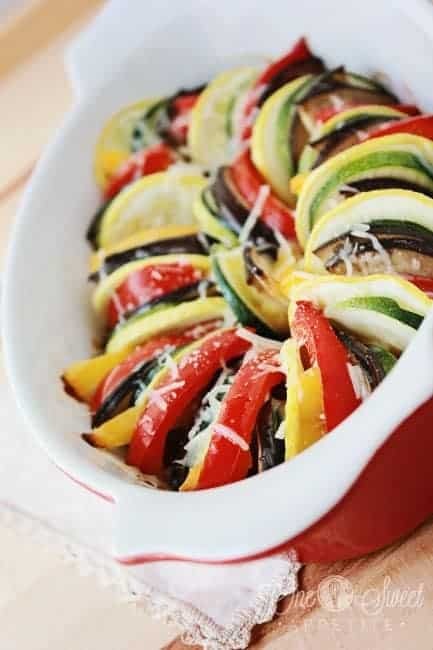 Bake for 30-45 minutes, or until your veggies are tender. Sprinkle with cheese and serve. This looks so pretty. I’m sure my kids would eat it just because of the fun colors! I love your idea of making a disney inspired dish every week! So cute! Also, I made ratatouille once, but it wasn’t nearly as pretty as this. But now I think I should make it again. Yum! Darling! and delish! love it! This looks delcious and so pretty! We love the movie Ratatouille here – definately a fave! GORGEOUS. Seriously. Can’t wait to try!!! 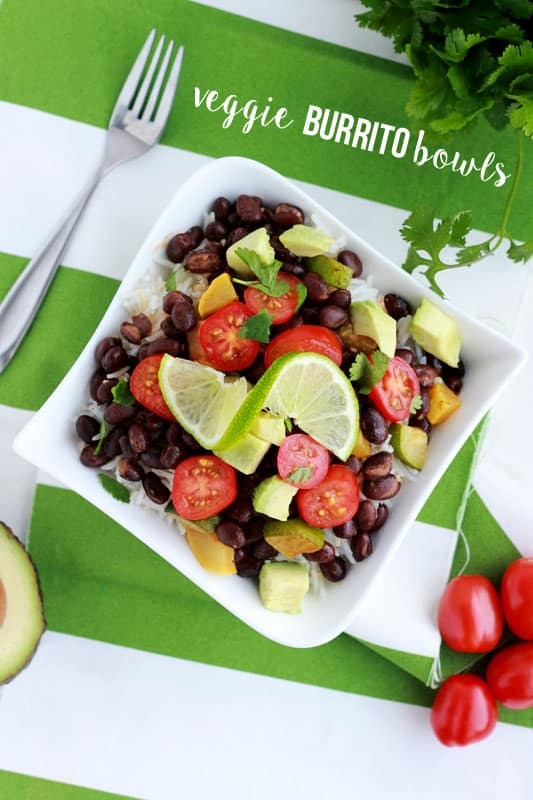 love the idea of having a Disney inspired recipe! I cant wait to see the rest. It looks so yummy!! Not only does this sound delicious, but it looks beautiful, too! Leanne, you are invited to dinner anytime! This recipe was delish! Made it tonight for me and my family. We licked the bowl clean! PS – Thrilled to be part of the Whipperberry Creative Team with you! love this! soooo easily veganizable <3 thank you! Credit where credit is due please! Thomas Keller served as consultant(so much as having producers briefly stagiare at French Laundry) and created this dish based on a slightly older dish he had made. I love this movie, but I think if you’re going to talk about this Thomas Keller dish, you should mention him!